Ladies, enjoy this flash from the past which was originally posted June 1, 2011. My spirit is broken. This holding pattern that You have me in is breaking me down and sometimes I wonder if “my next” is ever on its way. Some days, I feel like my life is shattered because so many things are not happening when I thought they would. Lord please help me because I am broken and I need to be fixed. In Jesus’ name Amen! Are you walking around in need of repair? Broken relationships– I have lost some friends, boyfriends and family on this journey of life. They didn’t die a physical death but our relationship died. It has caused me much pain, sadness and anger because although I think I am “Ms. Fix It” I haven’t been able to repair these relationships. Ultimately, I have to let them go. Do you have broken or abusive relationships in your life? You need to pray about it and ask God to mend them and if it’s not meant to be release them. Broken Home- For a long time, I held resentment in my heart for what I thought was abandonment by mother. Why didn’t she want us? …and where was Daddy? As I got older, I realized that it wasn’t that she didn’t want us but that her mental illness rendered her incapable of properly caring for us. When I found the dad that I had never known, I realized that he wouldn’t have been able to be the parent I needed either. Did you come from a broken home? Divorced parents? Single parents? Absent parents? Abusive parents? Alcoholic or drug addicted parents or siblings? BROKE parents? Are you still blaming them for your broken childhood? Many of us are walking around broken. We have holes, tattered edges and pieces missing from us. Some of us have been broken for so long we have accepted the brokenness as normal, made a feeble attempt to put a patch on it and keep moving. We don’t wear tattered clothes so why are we living with tattered spirits. In order to be restored we must be repaired. 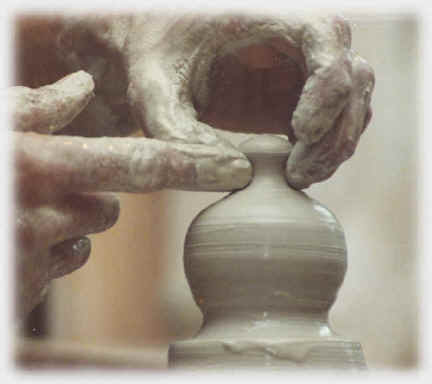 Only a potter can take something that is malformed or devoid of form and turn it into a stunning usable work of art. When it gets cracked, he can fix it and when it’s torn into a billion pieces he can put it back together again. Just because you have a BROKEN PAST doesn’t mean you have to have a BROKEN FUTURE. The potter yearns to put you back together again. Thanks in advance for blessing someone through this EmpowerMoment. There are many lives including my own within reach of this blog that suffer from: broken hearts; broken spirits; broken homes and broken relationships. Jesus, I ask that You provide total restoration. Remove the fix a flat and patches and make us like new tires, ready to roll and meet the demands of the road of life. Lord, I know I can find everything I need at the potter’s house. In Jesus’ Name, Amen! EMPOWER yourselves by allowing the Potter to repair you like new. He can fix all of the brokenness in your life and restore you. your emails literally always come at the time i need them…and the content is Always relevent to my circumstance at the time…..i am a new babe in christ and finding my way…and seeking the Lord. Thankyou.